I asked a fellow classmate if she had any songs that she knew of as a tradition in any parts of her life. She told me about a song that one had to learn in order to be initiated onto the theatre team at her high school. It was a variation of the song Lean on Me, with added words that acted as puns for each line end, they would do this before every show, and you had to know the song if you wanted to be in the show. Background Info: This short variation of Lean on Me was something that Greer had to learn to become initiated into her theatre program, and something that she had to teach grades below her. This was a comforting song that they sang before shows to cool their nerves and recognize that they all had each other’s backs during the show. Context: I learned about this tradition while at coffee with Greer, we both shared stories about certain traditions, and songs that we were familiar with or were a part of throughout our lives. Analysis: I thought this was interesting because it was both a song and a type of initiation. I think them adding small chants at the end of each line as puns brought people together in a fun way, and she said it was something that she looked forward to in each show. I personally don’t have any type of song or tradition similar to this so I thought it was very cool. When talking to one of my roommates Braxton, I asked if he had any sort of initiation type things associated with his family. Background Info: Braxton is originally from Pittsburgh and now lives in Los Angeles. I always see him wearing this and never knew what it was, but Braxton made it clear to me that when a man in the family received this necklace he was “initiated” into the manhood club in the Swann family tree. It is something that goes back in many generations. Context: I asked Braxton about this while talking to our class in a conversation about family initiations. 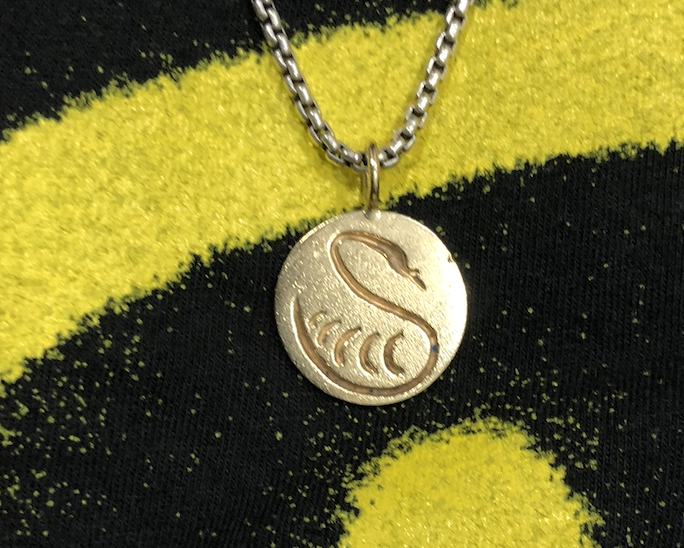 Analysis: I think this is a very cool way to integrate a sense of initiation and belonging to a group in a family, Braxton knew that he was going to get this necklace when he turned 16 so he had something to look forward to. I think I want to integrate something similar in my family and be the one to start it because I love this idea. Main Piece: So in the wrestling team we also did kinda have like another ritual. I mean it was kinda hazing but everyone had to do it or else they wouldn’t really be considered part of the team. It wasn’t like harassment or anything (he said this with a joking tone and giggling at the same time). Well after… each year after tryouts whoever made the team would have to get the old singlets from like people who had been in the team and wear them for an entire day. It’s like a tradition we have… well more like an initiation. For us it symbolized like following in the footsteps of more senior teammates. I am pretty sure though it is also for fun. Context: I arranged with Bryan at a Starbucks. It was pretty loud and their seemed to be a business meeting a few tables away. Bryan was talking loudly so I could hear. Background: Bryan was born in Guatemala but came to the Unites States when he was a baby. He was raised in a predominately Hispanic community. He is currently attending California State Long Beach where he is studying Philosophy. Analysis: In Bryan example of hazing, we can see a type of folk ritual called initiation. Before any person is accepted to the team, the need to be initiated by symbolic tradition. It is very similar to other types of initiations in which a person must pledge themselves by doing some kind of an embarrassing act. For example, this ritual is similar to sororities initiations that allow them to be part of their group. “So this happens once in twelve years. It’s a consecration ceremony that is done by uttering weighted hymns to evoke the entity of the supreme God…to…bless the… the temple. So we were there for that ceremony. It’s a five day long ceremony. It has five days of chanting, some Vedic hymns, uh…that invoke the supreme God, you know, to…energize the holy water. Which is then poured over the temple in a…in a ceremony called Kumbhabhishekam. That’s the ceremony. “Our temple here in the US has never had one before. Back in India, I had never been to one, either. This is very sacred and will bestow fortune on those who attend. It’s a key Hindu religious ceremony that not many people get the opportunity to witness. Our temple sent out fliers to remind and call us. This temple ritual is rare and not all Hindus experience it or have the chance to attend a similar ritual. Having sacred and rare rituals like this once in twelve year event increases the amount that community members value such traditions. Thus, when such sacred rituals do occur, a large portion of the community members attend and are united in their religion and as a community. The informant is a middle-aged Indian-American male, who grew up in an urban setting in India with three siblings. While he moved to the United States over 30 years ago from India, many of his family members still live there, and he enjoys maintaining his links with them through his heritage and Hindu religion. “So there’s multiple ceremonies. So once the man asks for permission from the to-be bride’s dad, there’s a mini celebration just between the intimate family members. And then, following that, there’s kinda an engagement party. So kinda similar to Nowruz, there’s different items that are symbolic. Like honey: both the groom and bride dip their fingers into honey. That’s symbolic of life being sweet, fruitful. I think that it is interesting that there are so many ceremonies involved, with different levels of guests invited. The number of events and variety of guests at each show what a big transition marriage is, from the merging of two families to a large community event. The emphasis of general Persian traditions over religious customs in these weddings is unusual, as most weddings tend to have a religious component. This shows that the role of the community is the highest, higher than any God, in this coming-of-age, rite-of-passage style ceremony. It also shows that the Iranian culture has adapted to view religion less and shared heritage and community more as religious heterogeneity increases. Moreover, symbolism is shown to play a large role again in such community, transitional life events, in order to cast protective and good omens before entering the next stage of life.